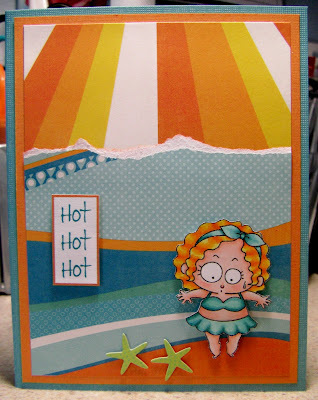 Theresa created a fun summery card with a Step On It image. She trimmed off a part of the original image (a scale) and put her on a hot beach. Love this idea! :) Thank you for sharing, Theresa! Please stop by her blog and leave a lovely comment for her! There is still time to play with this month's freebie challenge. I hope you'll join in!! What a great use of that fab image, love it! Love how Theresa coloured her hair! Gorgeous! Thank you for showcasing this card on your blog! And for the sweet comments. Your designs are a delight to color and use on cards! Fab card, I have used the robot boy on a card and thought you might like to see it. I loved colouring him and have just made two card with the freebie phones too. Great card, Theresa! What a clever way to showcase another of Torico's great images!